It's an honour to have some of your work showcased in this way, up there with the best aerial photographers in the world. 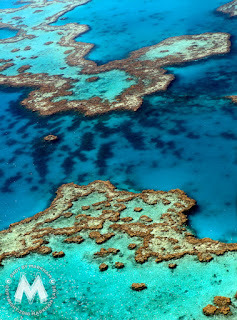 The photo is part of a collection of images I captured from a sea plane over the Great Barrier Reef National Park in late 2009. Interestingly, some of the underwater photography images I managed to capture on that adventure have also been showcased by other online blogs. No doubt, aerial photography is one of my all-time favourite genres - the thrill of the adventure, coupled with the unique perspective makes it a standout experience, as a photographer. My dream job would be to build a collection of natural landscapes, seascapes and cityscapes, hanging out of a door less helicopter or light aircraft, finding the artistic composition in what lies beneath. I might have my head in the clouds (pun intended) when it comes to this dream being realised but you never know when a benefactor or corporate entity might come along and say "now is the time to make that aerial photography dream a reality". To see more of my aerial photography collection, you can either find me on www.flickr.com/photos/ShotbyMarkham or go to my website http://www.markhamimages.com and browse through the "Landscapes" Gallery. Don't forget to share your "like" and send me an email to make a connection.